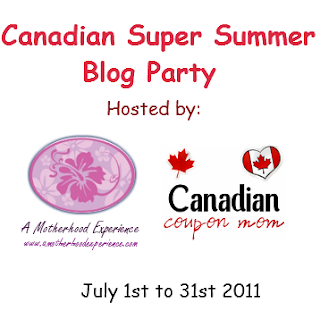 Everything is in place and we are happily preparing for our Canadian Super Summer Blog Party! This will be one great party you wont want to miss. The party will begin July 1st and go right through until July 31st! How it will work: Each week A Motherhood Blog and I will be showcasing great Canadian businesses on both our blogs. We ask that you follow each blog publicly on Google Friends Connect to be eligible to win during our blog party. Also please read each Mandatory entry as they will be a question geared to the business we are featuring that week. Each week we will announce a winner for the week before and then introduce our next giveaway. If you follow us on Twitter @CouponMomCanada and @AMotherhoodBlog make sure to Tweet with the hashtag #CSSBP and chat about the party with us! This is our first blog party that Alyssa and I are teaming up together and we are very excited to have some Great Canadian sponsors to be working together with. Can't wait to see you in July! Good Luck to all!